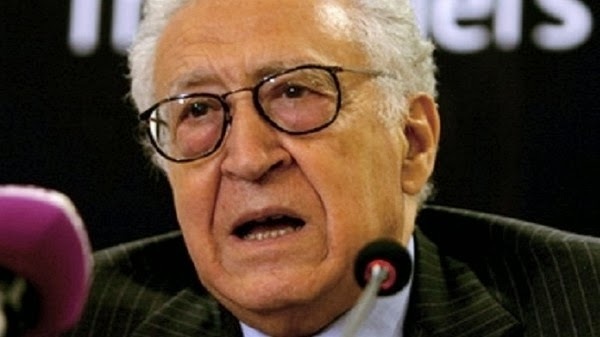 International troubleshooter Lakhdar Brahimi today held talks in Damascus, the last leg of a Middle East tour to lobby for a Syria peace conference, dubbed Geneva-2. I am personally of the opinion he will keep huffing and puffing well into 2014 without getting up the steep Geneva-2 hill. I will come back to the prospects of Geneva-2 in a subsequent blog. But here are highlights of what Brahimi told the Paris-based weekly newsmagazine Jeune Afrique in a 3,000-word interview published on the day of his arrival in Damascus yesterday. Jeune Afrique: Didn’t the agreement between the Russians and Americans [to remove Syria’s chemical weapons] put Bashar al-Assad back on the saddle? Lakhdar Brahimi: He was an outcast; he became a partner… Bashar was never put off his stride -- so there is no reason to think that. JA: Do you think he seriously considers running for re-election in mid-2014? LB: Many of those around him take his running for another term as an accomplished fact. He deems it as his absolute right, but that he would come to a decision in due time. He is adamant about completing his current term. What I proclaim aloud and to all Syrians is this: History teaches us that after a crisis like this, there is no turning back. President Assad could therefore significantly contribute to the transition from the previous Syria -- which is that of his father and his own -- to what I call the New Syrian Republic. JA: What about the Syrian opposition? LB: They are to consider who could represent them [at the peace table]. This is one reason why it takes time. Some of them even feel they should stay away from Geneva. In this type of situation, there are many camps. Armed and unarmed opposition, opposition based outside and inside [Syria], Islamists, seculars, etc... We must realize Geneva-2, unlike the conference held in 2012, is not an end in itself but the beginning. We hope the opposition will manage to agree on a credible and representative delegation. We must not delude ourselves: the whole world won’t be represented. However, the carry-over of this process will include as many people as possible. LB: Probably, but mind you there are two sorts of Islamists: those interested in the quest for peace, and those in the orbit al-Qaeda – such as Jabhat al-Nusra, for example. The latter wish to bring down the regime; they are not fighting to build a New Syrian Republic, but to set up an Islamic state. So they don’t give a hoot about Geneva. JA: Is Russian Foreign Minister Sergei Lavrov a reliable partner? LB: Absolutely – we know each other well. He was ambassador to the UN and is an outstanding professional. He is also extremely knowledgeable about the Middle East. Where Syria is concerned, there is much talk about Moscow's influence and the Russians’ political relations with the regime. The Russians have had a significant, longstanding and uninterrupted presence in Syria. Everyone bears in mind the Russian officers who are out there, but there are chiefly a lot of engineers. Remember, there are nearly 20,000 Russian women in Syria married to Syrians. The Russians know Syria very well. When [Tunisia’s Zine al-Abidine] Ben Ali, [Egypt’s Hosni] Mubarak and [Libya’s Muammar] Gaddafi fell, few thought Bashar would survive more than three months. Only the Russians kept saying: "Careful -- this is not the case, we are familiar with the country, and we know how it works. Syria is more complicated. " Some thought this was pretentious, that it was an unconditional expression of support for Bashar. JA: Do you think Syria’s national fabric can still be patched up? LB: Yes, I think so. What threatens Syria is not the country’s partition. I would be surprised if the Alawites really want to create some sort of a bunker in their small mountains. They know very well it won’t be viable. The real danger threatening Syria is a kind of "Somalization," one which will be more sustainable and profound than what we’ve seen in Somalia so far. JA: Does the idea of ​​a Shiite crescent fighting Sunnis across the Arab and Islamic worlds seem pertinent? LB: Effectively, we do have a problem, which is far from being new. I remember discussing it with [the highest ranking Shiite religious leader in Iraq] Grand Ayatollah [Ali] Sistani, when I was in Baghdad in 2004. I explained to him we might have on our hands a Shiite-Sunni problem stretching from Indonesia all the way to Morocco. He answered me saying Iraq was not Pakistan, where internecine strife was rife. He was wrong... We're not yet at the stage of a general confrontation, although [Shiite-Sunni] tensions are numerous in Lebanon, Iraq, Pakistan or Bahrain. But we must be vigilant because we’re not too far off. JA: What role is Iran playing in the Syrian conflict today -- that of a facilitator or an obstacle? LB: You know, from my point of view, everyone represents an obstacle... Seriously, I met the new president, Hassan Rouhani, and his minister of foreign affairs in New York. Iran's position is clear: there is no military solution to this conflict; an entente must be reached between the government -- towards which the Iranians are very close -- and the opposition that will result in free elections supervised by the United Nations. I’m under the impression they [Iranians] think Bashar would win the ballot hands down. JA: From [Mahmoud] Ahmadinejad to Rouhani, have you noticed a change in Tehran’s discourse and positions? LB: On other issues, such as relations with the United States, certainly. But on the Syria crisis, no, absolutely not. JA: What about Israel in all this?